USS Oscar Austin (DDG 79), the first Arleigh Burke Class Flight IIA destroyer, departed her builder's yard on 20 July 2000, en route to Norfolk and her commissioning ceremony. Oscar Austin is the 29th Burke class ship, and the 17th of the class to by built by Bath Iron Works. 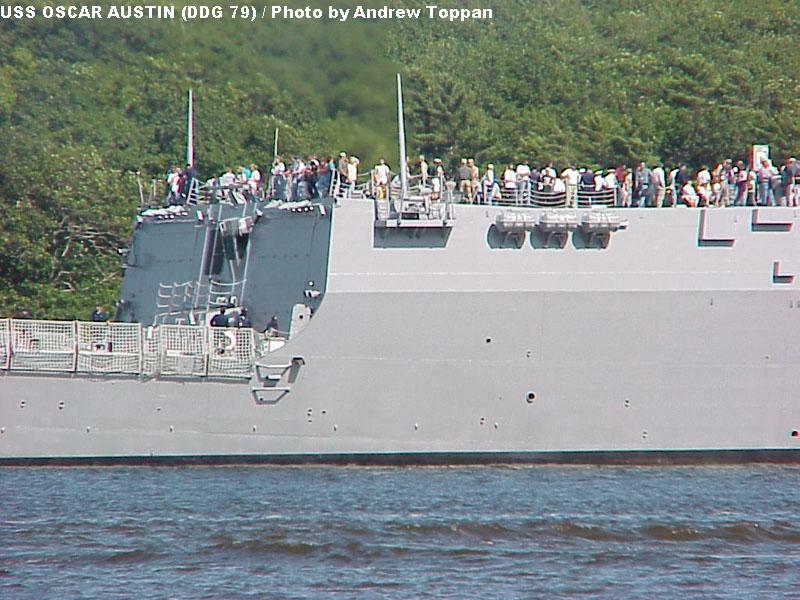 This "sailaway" cruise marked the end of a four-year construction period, during which thousands of men and women turned raw steel, pipes, wires and components into a high-tech 21st Century warship. Oscar Austin's construction started almost exactly four years earlier, with the first steel being cut on 19 July 1996. Her keel was laid on 9 October 1997, the ship was launched on 7 November 1998, underwent sea trials in late 1999 and early 2000, and was delivered to the Navy on 11 May 2000. 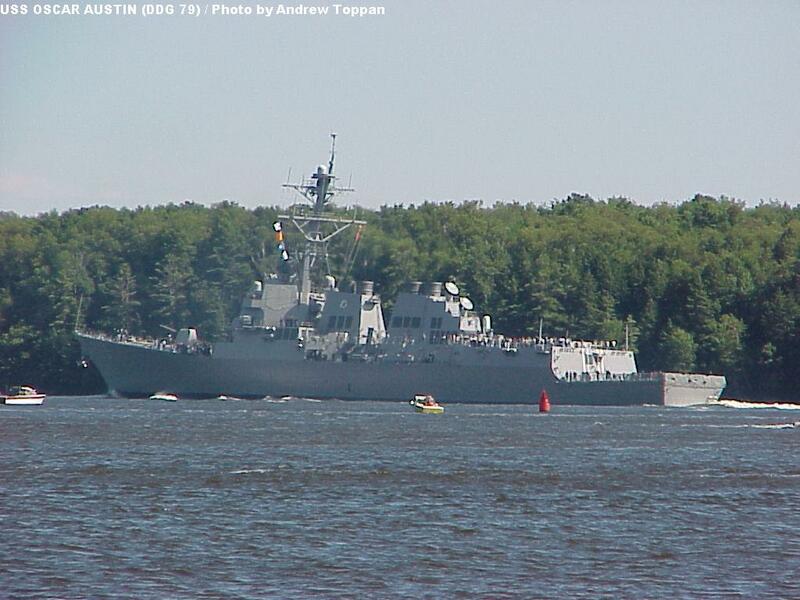 The ship will be ceremonially commissioned 19 August 2000, although she was placed "In Commission, Special" soon after delivery. 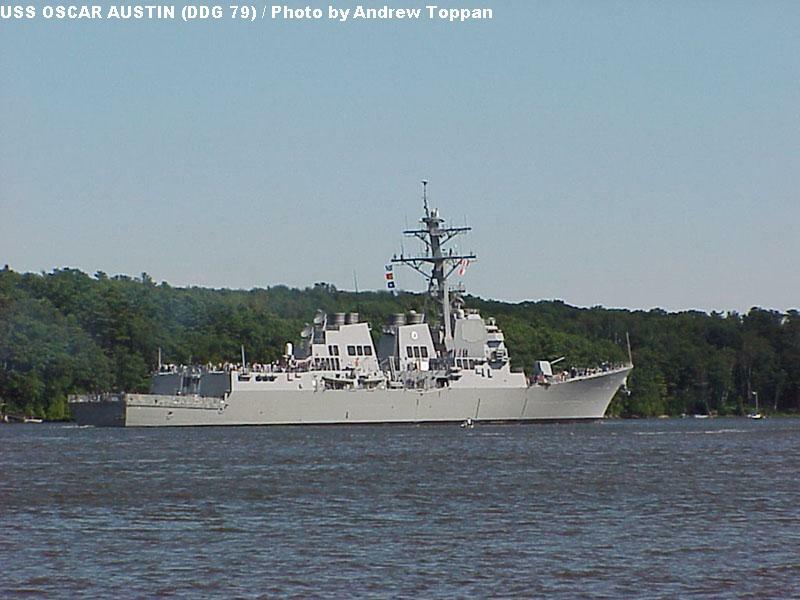 As the first ship of the Flight IIA upgrade to the basic Arleigh Burke design, Oscar Austin introduces a number of new capabilities and sytems to the fleet. Most significantly, the ship has been extensively redesigned to accommodate two helicopter hangars, placed on either side of the after VLS. Other upgrades to the ships' aviation capabilities include addition of Recovery Assistance, Securing and Traversing (RAST) helicopter hauldown systems on the flight deck, relocation of the helicopter control station, and additional berthing for a full aviation detachment. To accommodate these changes there have been numerous other alterations, including raising the aft VLS and aft SPY-1D radar faces by one deck level, relocation of the Mk32 12.75 inch torpedo tubes, deletion of Harpoon missiles and the SQR-19 towed array, and extensive internal rearrangements around the helicopter hangars. Other changes in the Flight IIA upgrade include a new electrical system arrangement, survivability and damage control upgrades, new starting systems for the generators, and various other upgrades throughout the ship. The thumbnail images and captions are linked to 600x800 images (approx. 60-70 kb); larger 1024x768 images (approx. 90-110 kb) are linked to the words "Hi-Rez Image". All photos are Copyright © 2003 by Andrew C. Toppan. This feature is not sponsored by, endorsed by, or otherwise affiliated with General Dynamics/Bath Iron Works. 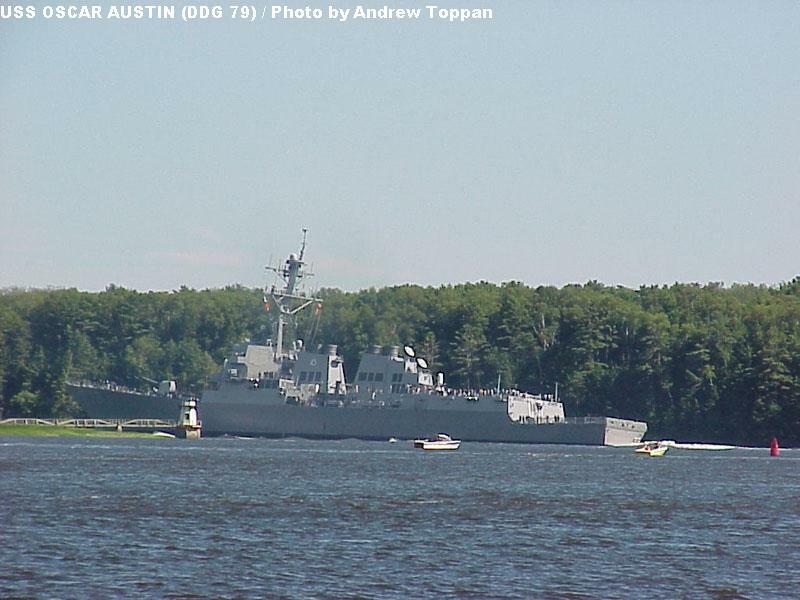 Oscar Austin underway in the Kennebec River, just south (downstream) of Bath Iron Works. Leaving her birthplace behind, she is now embarking on a 10 mile voyage down the narrow, sometimes twisting Kennebec River to the sea. The ship is approaching the Maine Maritime Museum (the former Percy & Small Shipyard), where a three-gun salute will be fired. The Museum and various residents along the river traditionally salute BIW ships as they pass downstream. Oscar Austin passing the Maine Maritime Museum. This section of the Kennebec River, known as the Long Reach, was once one of the greatest shipbuilding centers in the country, with dozens of shipyards along the riverbanks. 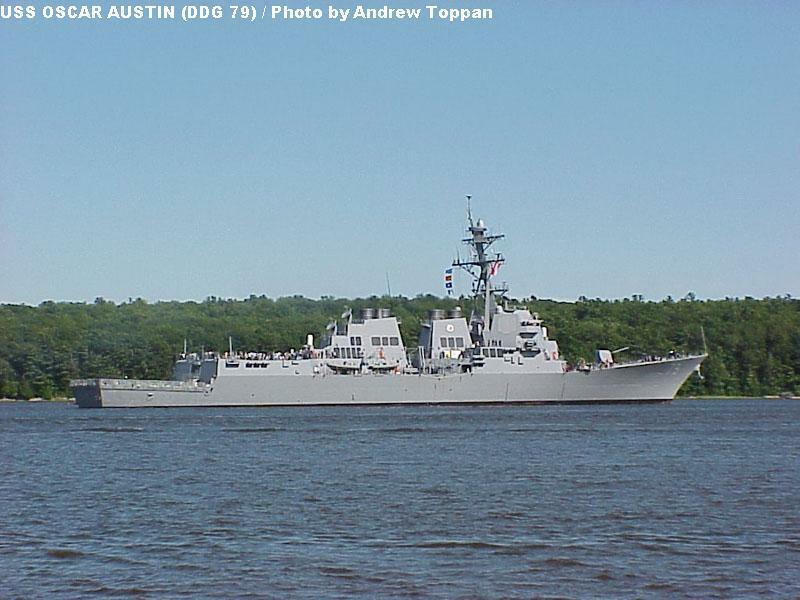 Today BIW carries on this tradition, as one of the finest shipyards in the country, building the most technologically advanced ships in the world. This view shows the major changes in the Flight IIA design - a raised deckhouse aft to house helicopter hangars, and the aft radar arrays raised one deck level. Closeup of Oscar Austin's superstructure. 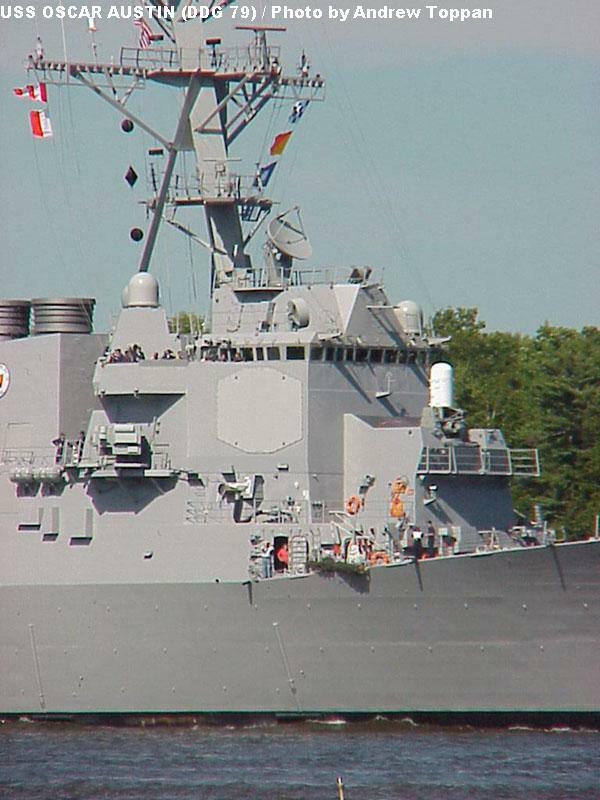 This view shows the Phalanx CIWS (ahead of the bridge), SPG-62 missile director (above the bridge), SLQ-32(V)3 electronic warfare antenna group (below the bridge wing), the starboard forward SPY-1D array, and the forward gas turbine uptakes (abaft the bridge). 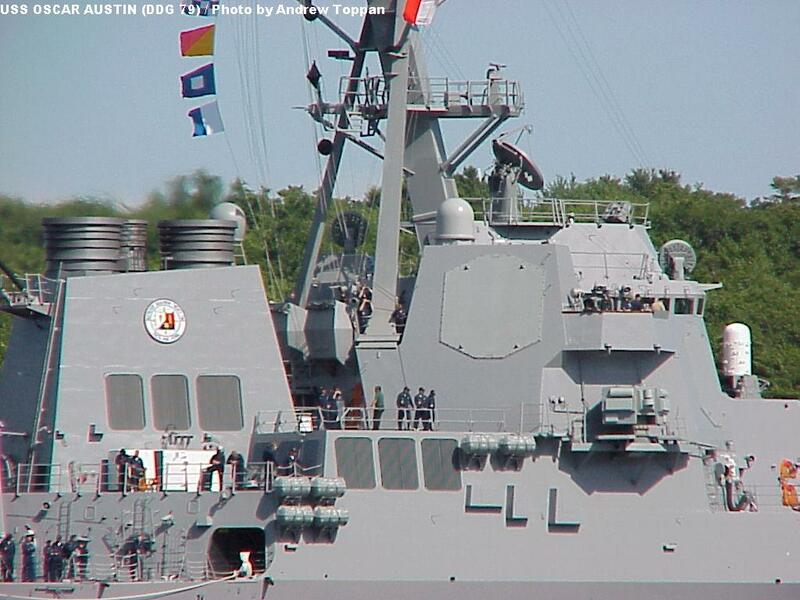 Closeup of Oscar Austin's superstructure, from astern. 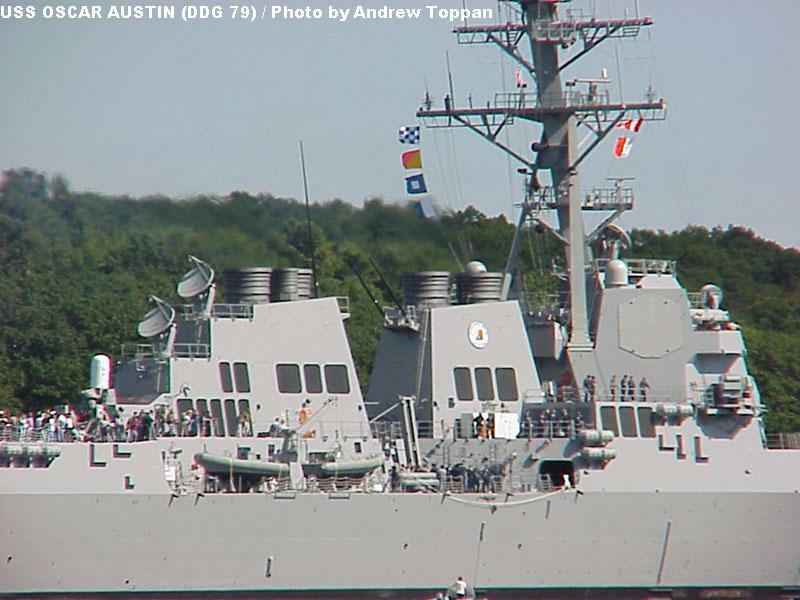 A more general view of Oscar Austin's superstructure and uptakes. Closeup of the helicopter hangar area. The helicopter hangar doors are visible on the aft face of the hangar. Ship's force and their guests are enjoying the view from atop the hangar, around the aft VLS and generator exhaust. Oscar Austin draws away, approaching Doubling Point. Doubling Point marks a 90-degree turn in the river, closely followed by a second 90-degree turn in the opposite direction, making it one of the trickier spots along the river. Oscar Austin makes the sharp turn to port around Doubling Point. 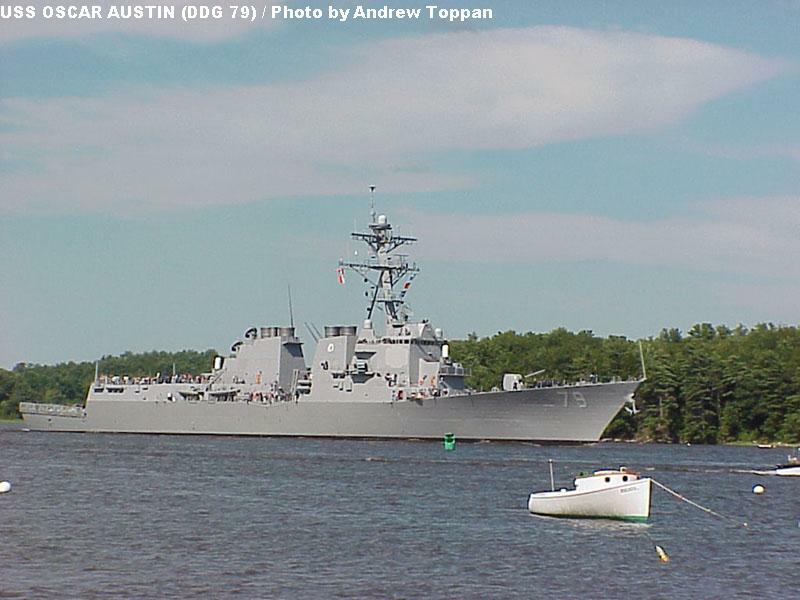 Although the DDGs are very manuverable ships, the rudders are not enough here, and the starboard throttles are advanced to swing the ship around quickly. 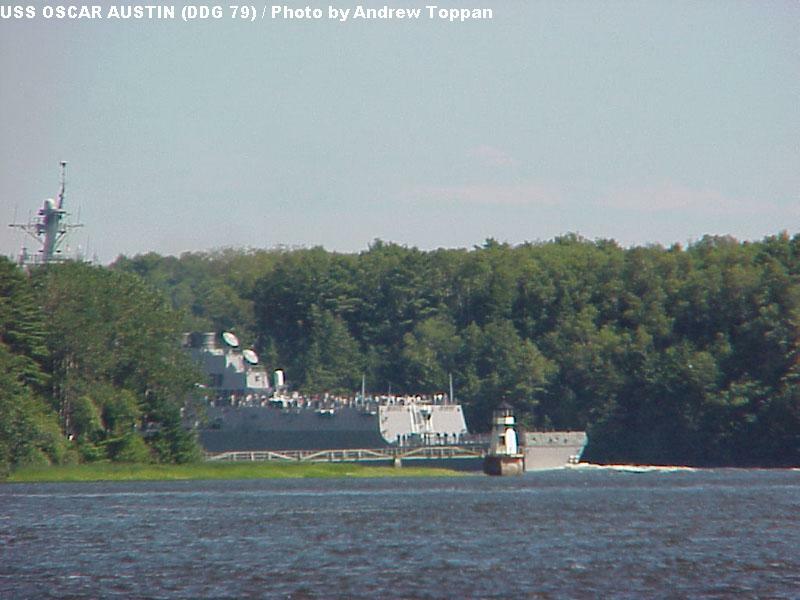 Oscar Austin heels to starboard as she completes the turn around the historic Doubling Point Light. The angle of heel creates the illusion of great speed, but this is really a result of the sharp turn - the ship is proceeding quite slowly, and won't build up any significant speed until she reaches the open sea. Oscar Austin vanishes beyond Doubling Point, leaving the BIW and the city of Bath behind.